I was lucky enough to receive an ARC of Episode 1 in the new Rising Storm serial soap opera. It definitely has my attention! This episode centers around building the town of Storm, Texas’s characters, and it mostly revolves around an accident that occurs in the first chapter. We’re introduced first to Ginny Moreno and her best friend Jacob Salt as they travel home for a visit from college. They get into a car accident and this episode deals with the fall out that occurs. The Moreno family consists of Marisol who stepped up to raise her sister Ginny and brother Luis when their parents were killed 10 years ago. Marisol runs a bakery/coffee shop in town, Ginny attends the University of TX and Luis is still in high school. The Salt family consists of Jacob who is preparing to get into Med School, his parents Celeste and Travis and his sisters Sara Jane and Lacey. Travis and Celeste own the town Pharmacy, Sara Jane just finished her first year of teaching a special education class and Lacey works part time at Marisol’s bakery and attends high school. First on the accident scene is Sheriff Dillon Murphy whose father Aiden owns Murphy’s Pub. Dillon is secretly in love with Joanne Alvarez who is married to abusive Hector. They have 3 kids … Marcus who isn’t in town right now, spoiled Dakota who is a teller at a bank in town and Mallory who is dating Luis Moreno. Based on Episode 1, I’m excited to read the next one to see what comes of secrets revealed in this one. A missing husband, cheating spouses, paternity of a baby, immoral politicians … and the world that’s revolving around them as if nothing is happening. Rising Storm, an ongoing drama. A powerful series conceived by Julie Kenner & Dee Davis!! Have you heard??? 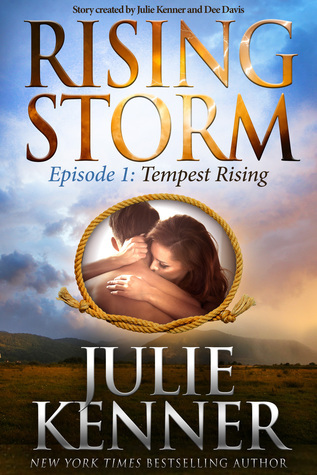 A storm is coming…I am so excited to share the new about Rising Storm – a new series created by me and Dee Davis, and presented by 1,001 Dark Nights!! ​A town nestled among rolling hill​s and painted with vibrant wildflowers, ​where everything ​seems like perfection. But there are secrets beneath the facade. Dark and ​powerful secrets. The kind that can destroy lives and tear families apart. ​That can cut through a town like a tempest, leaving jealousy and destruction in its wake, along with shattered hopes and broken dreams. Rising Storm is an ongoing drama. A powerful series conceived by Julie Kenner and Dee Davis, full of scandal, deceit, romance, passion, and secrets. …get caught in the storm! Joining Kenner and Davis in the “writer’s room” is an incredible group of New York Times bestselling authors such as Lexi Blake, Elisabeth Naughton, Author Jennifer Probst Fan Page, Larissa Ione, Rebecca Zanetti – Author and Lisa Mondello who have brought their vision of Storm to life. A serial soap opera containing eight episodes in season one, the season premiere of Rising Storm, TEMPEST RISING, debuts September 24th with each subsequent episode releasing consecutively this fall.